I’m working on two projects right now. One for an upcoming blog hop so I can’t show it to you yet, but I will next week. The other is a Christmas Pattern I’m working on. I’m trying to get it done (yet again) in time for the Christmas season. If I don’t finish it up in the next week or so I don’t know if I’ll release it this year. It’s a small pillow or wall hanging so in order for it to be useful this year I have to make sure I release the pattern with enough time for others to make it. 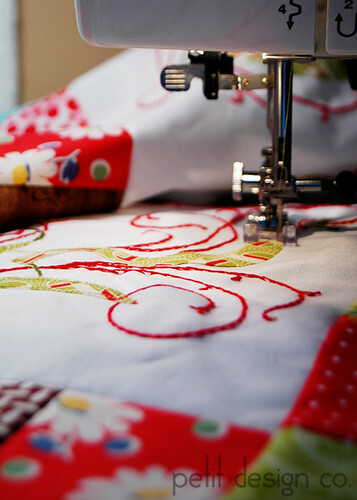 Maybe I’m just a super slow quilter! I kinda think it’s the kids, and the household :) Anyway, here is a sneak peek. Yup, there’s a little bit of embroidery involved. Every once in a while I indulge in a little hand work, but don’t tell anyone.